Executions on New Year’s Day have not been unheard-of in U.S. history, but it’s been Auld Lang Syne since the last such event — a North Carolina double-gassing on this date in 1943. 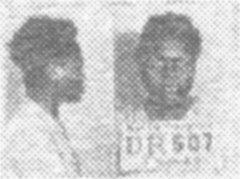 Daniel and Rosanna Phillips, black sharecroppers, died consecutively in the Raleigh Central Prison gas chamber for the ax murder of their farm owner a mere five months before. The U.P. wire report (as run in the New York Times, Jan. 2, 1943) says that the pair forgave each other by the end. Still, Daniel was gassed first “at the request of the State Parole Commission, on the possibility that he might make a last-minute statement exonerating his wife,” which would have spared Rosanna. One wonders if she was still in a forgiving mood when she found out that he hadn’t breathed the word that might save her. At least some newsmen also reported a malfunction in the chair’s cyanide-dropping rack for Rosanna’s execution, which required guards to re-open the chamber after its strapped and hooded subject had been sealed in, and putz about the mechanism while she waited. * Actual reason to do this on New Year’s Day: the mere happenstance of automatically scheduling execution dates a set number of days after the defendants’ last appeal failed.